The Band of The Brigade of Gurkhas performed a Beating Retreat ceremony at Brompton Barracks following a reception in the Corps Officers’ Mess, given by Lieutenant Colonel Will Robinson, Commanding Officer of 1 Regiment RSME and Holdfast Training Services. The evening reception, followed by the ceremony of Beating Retreat, was an opportunity for the Regiment to thank the local communities and organisations who have supported and worked alongside the Chatham training facility. 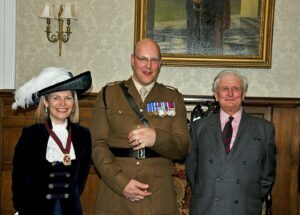 Prior to the event a tea party hosted by Brigadier Matt and Mrs Becci Bazeley was held at Pashley House. Brigadier Bazeley is ex-officio Deputy Lord Warden and Deputy Constable of Dover Castle in addition to his responsibilities as Commandant of RSME Group. During the ceremony the Gurkhas performed a Kukri dance – all young Ghurkha men learn the dance to hone their skills in the use of the fearsome weapon, the kukri knife. The ceremony concluded with Viscount De L’Isle taking the salute from The Band of the Brigade of Gurkhas.